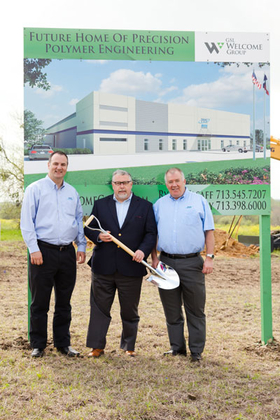 From left, Steve Jagels, market manager, oil & gas; Paul Gillyon, managing director; and Stewart Porter, operations director, pose after Precision Polymer broke ground on its first U.S. manufacturing facility, to be built in Brenham, Texas. BRENHAM, Texas—Precision Polymer Engineering Ltd. broke ground on its first manufacturing facility in the U.S. in April. The firm said it will construct a 30,000-sq.-ft. plant in Brenham, located about an hour outside of Houston. Initially, the company will use more than 50 percent of the space and invest nearly $4 million to populate it with about 20 employees and 14 presses. Six presses will produce materials for the semiconductor market in a clean room, while the remaining eight primarily will serve the oil and gas market. The $4 million investment does not include the cost of constructing the building, which Paul Gillyon, Precision Polymer's managing director, said is projected to begin production in November. Gillyon said Precision Polymer's current 75,000-sq.-ft. manufacturing facility in Blackburn, England, is at capacity with about 90 presses. The firm's current U.S. presence consists of sales offices in Houston and San Jose. Precision Polymer could triple the amount of presses with the remaining capacity in Brenham, Gillyon said. As long as growth remains as projected, the firm could do so in about five years. At that time, Precision Polymer has an additional 20,000 square feet on the lot if it wants to extend the building and create more capacity. Gillyon wouldn't go into specifics regarding the company's financial results, but he said the firm has experienced healthy double-digit growth in recent years. “We will add people as the capacity needs dictate,” he said. The company will examine whether to fine-tune where certain products are made. Gillyon said it will consider transferring capacity from Blackburn to Brenham to free space for the England facility to focus on other markets. The firm considered about 10 towns within the Houston area. He said Precision Polymer ultimately settled on Brenham because of the high-quality site the company found for the building and the access to labor in the Brenham area, not only in the immediate area but also in Houston and in College Station, Texas, home of Texas A&M University, located about 40 minutes north of Brenham. Labor was arguably the biggest factor in the decision. Gillyon said the firm has received strong indication from some of its peer group companies that the labor pool in Brenham is very loyal. “We felt we'd recruit people who'd be a bit more loyal to stay with the company,” Gillyon said. Precision Polymer Engineering is a subsidiary of Idex Corp. and provides high performance O-rings, technical moldings and sealing solutions to a variety of industries, including oil and gas, semiconductor manufacturing equipment, food and pharmaceutical production, chemical processing, large-bore diesel engines, and aerospace. Gillyon said O-rings account for about 85 percent of the company's output.